The 134-acre Preserve features nearly 1,000 species of native plants of Pennsylvania and offers a place to walk in a peaceful, natural setting. Opportunities abound to explore winding trails and enjoy wildflowers, bird watching, quiet meditation, photography or simply appreciating the beauty of Pennsylvania native plants. Visitors can meander through woodlands, meadow and streamside or perhaps catch a glimpse of turtles and frogs in the pond. One of the largest of 11 protected river island natural areas, Hendrick Island was carved out of the Delaware River shoreline. Also known as “Island Farm,” the island once held a farm, a sawmill, and a farmhouse. The buildings were destroyed in the 1955 flood, but the island is protected by Delaware Canal State Park for its natural and archaeological significance. The 112-acre island supports a large deciduous forest, despite its somewhat sandy soil. Wildlife includes deer, which occasionally swim to the island from Pennsylvania and squirrels. The shoreline is generally rocky, especially along the eastern coast and northern tip, and populated by several species of fish and water snakes. Uncommon among the islands of the Delaware, Hendrick Island has quite varied topography. The center of the island is about 15 feet above the normal height of the river. As a result, there are two distinct ecological areas on the island: a flat, frequently submerged riparian habitat along the shore and a deciduous forest habitat farther inland typical of the terrain in the surrounding areas of Pennsylvania and New Jersey. For 100 years, beginning in 1832, sure-footed mules towed boats loaded with coal and other cargo along the Delaware Canal. 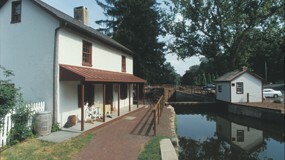 The Locktender’s House at Lock 11 at the Canal Boat Ride Landing serves as the first interpretive center within Delaware Canal State Park and as headquarters for the Friends of the Delaware Canal. The restored early 19th century house illustrates “Life at the Lock” and canal history through exhibits, artifacts and restoration details. Boats can’t go uphill or down, so canal engineers installed 23 locks on the 60-mile-long Delaware Canal to raise and lower boats onto stretches of level water. At the recently restored Lock 11, visitors can learn how the locks work and appreciate the waterway’s role as one of the nation’s great towpath canals. In addition, visitors can take to the water on a mule-drawn canal boat which leaves from the Canal Boat Ride Landing. The Locktender’s House is open year round. Visitors can travel through the rolling hills and valleys of Bucks County in restored 1920s vintage passenger coaches and antique bar car pulled by an authentic steam locomotive or a historic diesel locomotive. The train takes the same historic route that was filmed in the 1914 movie series Perils of Pauline. The train station has been in operation since 1891. The Parry Mansion was built in 1784 by Benjamin Parry, one of New Hope’s prominent citizens. It was occupied by Benjamin Parry’s direct descendants until it was purchased by the New Hope Historical Society in 1966. The furnishings of the eight rooms reflect 125 years of decorative changes experienced by the Parry family. Each room represents a different time period during which the Parry’s occupied the mansion. Tour guides are trained to offer historical information along with stories that have been passed through generations. Phillips Mill was built in 1756 by Aaron Phillips as a water-powered grist mill. It also served as an informal community center for the local farmers and their families. Three generations of the family lived on the property prior to the purchase of the mill and adjoining farm in 1894 by Dr. George Morley Marshall. The farmhouse became the home of Dr. Marshall’s friend, artist William Lathrop. Lathrop’s home, the mill, and their accessory buildings emerged as the intellectual center of a growing community of artists, whose rigorous discussions of aesthetics, philosophy, and politics became well-known. Besides Lathrop, artists such as Daniel Garber, Edward Redfield, John Folinsbee, and Walter Schofield together with their lesser known contemporaries, Fern Coppedge, Walter Baum and Clarence Johnson formed the New Hope School. The New Hope group exhibited together in the United States and Europe, most notably between 1916 and 1918. 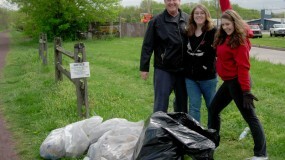 The Phillips Mill Community Association organizes several exhibitions featuring the fine arts throughout the year. These events include Art, Photography, and Theater productions. This restored, water-powered mill was built in the 1830s by the Neely family. The original mill, constructed nearly a century earlier, was located approximately 100 yards downstream from the present mill. The gristmill is open for tours by appointment. This house is an example of early 18th-century colonial architecture. In 1776, the home of Robert and Hannah Thompson on Pidcock Creek served as a temporary hospital sheltering American soldiers suffering from wounds and disease. Two notable patients and patriots, James Monroe and General Washington’s cousin William Washington, convalesced here after the Battle of Trenton, a turning point of the Revolutionary War. Nearby stand the Thompson-Neely Barn and various outbuildings, all of which are open seasonally for tours. The Virginia Forrest Recreation Area is an ideal starting point for biking along the Delaware Canal towpath and for rides that use the towpath to reach back roads with no public parking nearby. Located on Route 32 just north of Center Bridge, the recreation area consists of a few picnic tables, rest-rooms, and a large parking lot next to the canal. The Pennsylvania part of this ride goes north along the towpath to the town of Lumberville, where it turns onto Fleecydale Road—a favorite with cyclists—for a gentle climb to the town of Carversville. In New Jersey, the route goes south to Lambertville, where it turns inland. Like Fleecydale, Alexauken Road provides an easy and pretty climb out of the river valley.